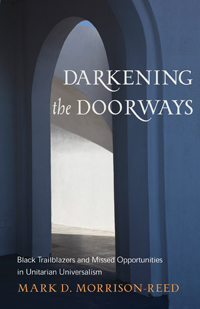 On one hand, Darkening the Doorways is a tale of systemic paternalism and a prejudicial failure of vision, of squandered opportunities and good intentions turned into tragedy more often than triumph. On the other hand, it is a tale of idealism, courage, intrepid allies, dogged determination and steadfast loyalty in the face of rejection. The life stories and achievements of the African Americans you will discover in these pages are remarkable. Mark Morrison-Reed's collection of profiles and essays, supplemented by archival documents, revives their memory while pointing toward the evolving multicultural future. Several free supplemental materials are available on the Skinner House Companion Resources page. “I Cannot Approve” Wade H. McCree Jr. When this project began in 1977, I was a young man; I am no longer. I aged and it grew as I tried to answer a perennial question: Why are there so few African-American Unitarian Universalists? As the twentieth century progressed, many in our faith community grew ill at ease over the absence of significant numbers of black folks and other people of color within Unitarian Universalism. Sometimes, when awareness of this uncomfortable reality breaks through, Euro-Americans feel bewildered. They cannot reconcile it with a self-conception that holds Unitarian Universalists up as liberal, progressive people. So, from different perspectives, we end up sharing the feeling of confusion—and a yearning that it might be otherwise. This book aims to dispel that confusion. The story told by the biographies, memoirs, documents, and essays gathered here is painful but not befuddling. On one hand, it is a tale of systemic paternalism and prejudice-induced failure of vision, of squandered opportunities, and of good intentions turned into tragedy more often than triumph. On the other hand, it is a tale of idealism, courage, intrepid allies, dogged determination, and steadfast loyalty in the face of rejection. This exploration of the tainted reality behind Unitarian Universalism’s espoused liberalism is heart-wrenching but leads to an important truth: The premise that liberal religion has not and cannot attract African Americans is false.